Are you ready to prepare your lawn for spring? It’s almost time to wake up your lawn from its winter slumber. Spring is actually one of the most important lawn maintenance seasons. The steps you take during the next few weeks may help to prevent your beautiful lawn from being overtaken by weeds, insects and diseases. When preparing for spring, make sure you clean your gutters and thoroughly rake your lawn. These steps will help ensure a healthier lawn and garden. Start with an inspection. This is a great excuse to spend time outdoors soaking up some spring sunshine. Check your gutters. They may need to be flushed before the spring rains begin. Clean gutters will help to prevent the plants beneath your eaves from drowning, and may also protect your foundation. You’ll also want to look for any dead or dying turf, mold damage and debris that may have accumulated. Do a thorough raking. Removing leaves, sticks, matted grass and other debris will make it easier for new grass blades to grow. Raking encourages better air flow, which helps to prevent insect infestation as well as diseases. Try to keep your lawn’s thatch level at no more than a half inch. Any higher and it could be detrimental to your turf’s health. Repair injured turf areas. This is a good time to replace any turf damaged by the snow plow, salt and/or snow mold. Apply a pre-emergent herbicide. Purchase a soil thermometer. They are relatively inexpensive at your local garden supply store. The best time to apply a pre-emergent is when the soil temperature reaches 58 degrees. When the soil hits 60 degrees, weeds start to germinate and the herbicide won’t be much help. Crabgrass is particularly hard to control once it’s germinated, so timing is critical. The best time to aerate your lawn is after a light rain when the soil is damp. need the added nutrients to withstand summer’s heat and drought. Cool-season grasses, which were dormant all winter, will rely on the energy and nutrients they’ve stored in their roots. Choose a day after a light rain to aerate. Aeration, which is when you punch small holes in your lawn, helps water, oxygen and nutrients to reach grass roots. This stimulates root development. Aeration machines work more efficiently when the soil is damp, but not soaked. Prepare your lawn mower for its first spring cut! Remember to mow when grass is dry to prevent spreading diseases and a clogged mower. 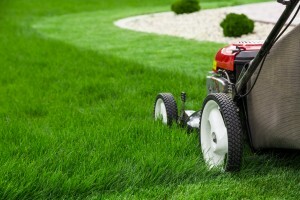 As your grass starts growing, prepare your lawn mower for the first cutting. Just be careful not to mow when your lawn is wet. That causes diseases to spread, and the wet clippings can clog your mower.